April is Autism Awareness Month, and we wanted to share this great partnership between Oakley and Talk About Curing Autism (TACA), an organization that supports, empowers and educates families living with autism. Oakley and TACA have teamed up to spread the message of hope. Using two popular sunglass styles, Fuel Cell and Ravishing, Oakley has created unique renditions of these frames and will donate $20 to TACA from each sale of these frames. 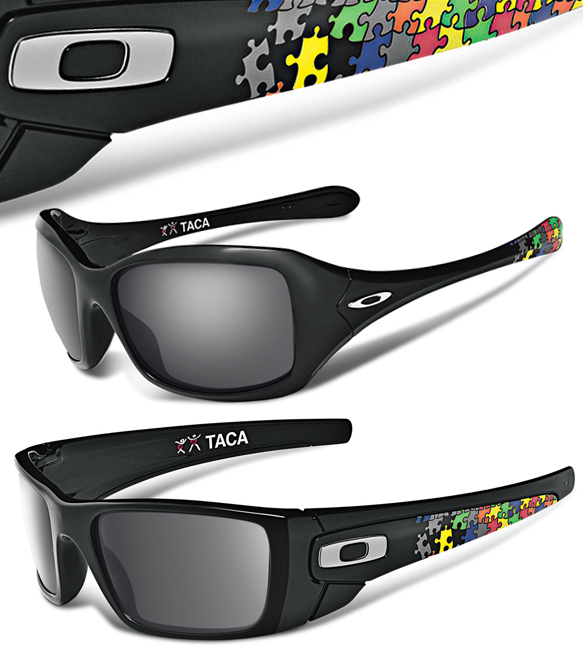 The temples of the new TACA Oakley Fuel Cell™ and TACA Oakley Ravishing® frames will feature the art of a puzzle motif, signifying that the puzzle of autism can be solved. Women will swoon over the Ravishing frame which exudes sleek sophistication and men will get amped for Fuel Cell’s sporty-chic, wraparound style. Eye-opening statistics like one in every 91 children in the U.S. is diagnosed with an autism spectrum disorder, show how important it is to support organizations like TACA in their mission to help children with autism reach their true potential. Show off your shady style while supporting an amazing cause. To purchase these frames and learn more about each organization, visit Oakley and TACA.